Mark your spot and get noticed with our custom printed Pinpoint Flags. With 3 sizes to choose from we can get you noticed from near or afar. 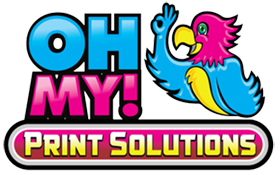 They are print beautifully with a dye sublimation process, on a 110 GSM fabric that is good for both outdoors and indoors. Pinpoint Flags are excellent for races for distance markers. It has a 360° spigot and comes with your choice of a heavy duty Base Plase or Spike Base. Double Sided Print, can print 2 different images on each side. Need a unique way to get the message out? Look no further than custom printed PinPoint Flags. These double sided signs are meant to create impact. When used outdoors in windy conditions they rotate on their spigot creating a 360° view for the crowd. 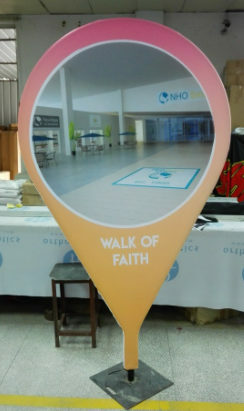 They are Excellent for large events and retail spaces such as malls, conferences and anywhere where you need a lot of people to see large portable signage. Pinpoint Flags are available in 3 sizes and are double sided. The largest size being 8.5′ high! Ask us for a template and design your own, we have no limitations on colour or design. to see maybe because a lot of text or a big bold picture. Case in point, the examples below are using Pinpoint Flags to show a large audience at a conference what to expect at the upcoming convention. Within Canada to such places such as Vancouver, Calgary, Edmonton, Winnipeg, Saskatoon, Ottawa, Toronto, Quebec, Montreal and Halifax. Within USA to places such as Minnesota, Ohio, Virginia, Washington, Seattle, Los Angeles, San Fransisco, San Diego, California, Texas, Houston, Memphis, Florida, Miami, South Carolina, Boston, New York, Las Vegas, Reno and more! Worldwide to places such as Singapore, Tokyo, Mexico, Panama, Colombia, Puerto Rico, UK, London, Sweden, Finland, Spain, italy, Germany, France, South Africa, Nigeria and more.